We had a lovely time at Terak's show. 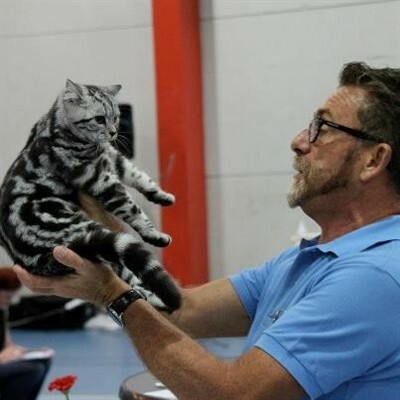 On Saturday 3 offspring Nominated for Best in show, and 1 x Best in Show,1 BIV silvertabby and Lady Mary's BIS Breeding. On Sunday 1 Offspring Nominated for BIS and 1 x BIV Silvertabby. From left Lady Mary's Silver Garcita - 2 x BIV Silvertabby. 1 x Best in Show kitten 3-6. Owned by Turid Nicolaysen. Became 1 x Nominated for Best in Show. Proudly he became 2 x Best in Show breeding male. Lady Mary's litter 1 x Best in Show in competition with Bengal litter. Congratulations to Sp./Gic.Lady Mary's Silver Siri (BRI ns 22 62) 1 x Nominated for Best in Show Neuter. Owned by: Tove Husum & Roar Celius.